I've seen that, obvoulsy though Superman wasn't trying his hardest and was underestimating him. Were not surely suggesting that DS can really dodge Superman and is too fast for him? *sigh* I simply post the feats I deem impressive. Any discussion of the validity of feats usually ends up ruining respect threads somewhat(at least for me). I don't want to see this one chalk full of lengthy, heated arguments concerning whether one of the posted feats are or are not PIS,CIS,etc. I'd like it if we could leave any speculation concerning any of the feats out of respect threads. So what? Still an insane feat. Keep up the good work Namor. Brilliant respect thread. 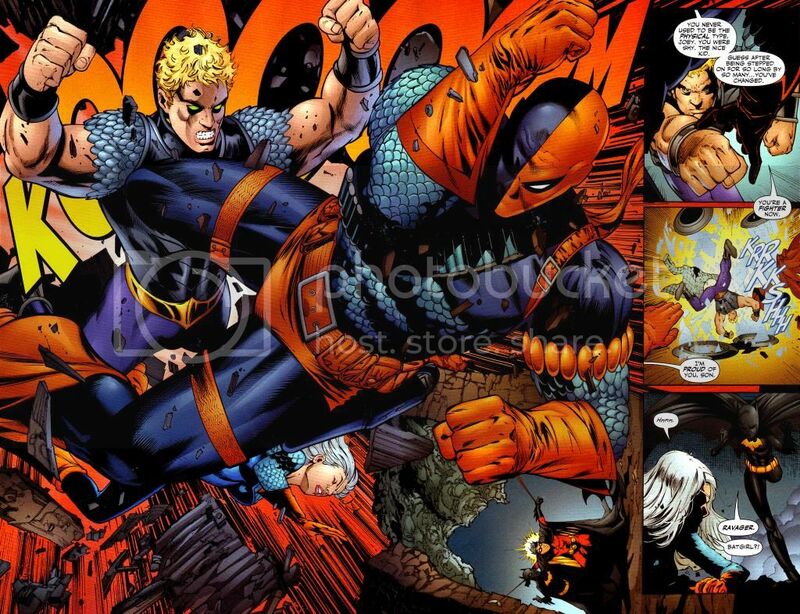 Deathstroke is an amazing character. I like how even though he's a villain, he still has a sense of honour and his own morals. BTW, correct me if I'm wrong but I'm sure that's Maggie Sawyer (the woman who keeps telling the cops to hold fire and who causes Slade's vehicle to crash). If so, it's awesome that Slade has respect for her. Grayson says a few words about Slade. He's just come into town and grayson intially decides he'll need backup......but then decides he'll face him himself(bad mistake). 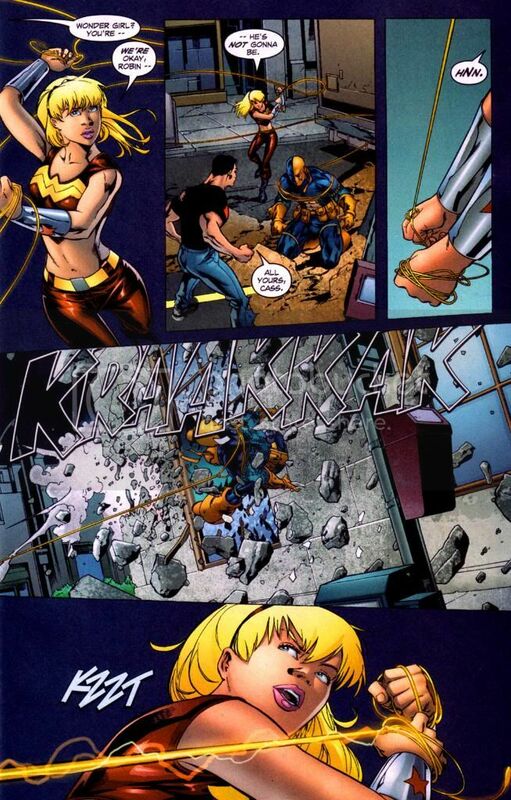 Deathstroke Vs. Cassandra Cain, Round 1. Deathstroke Vs. Nightwing, Round 5. 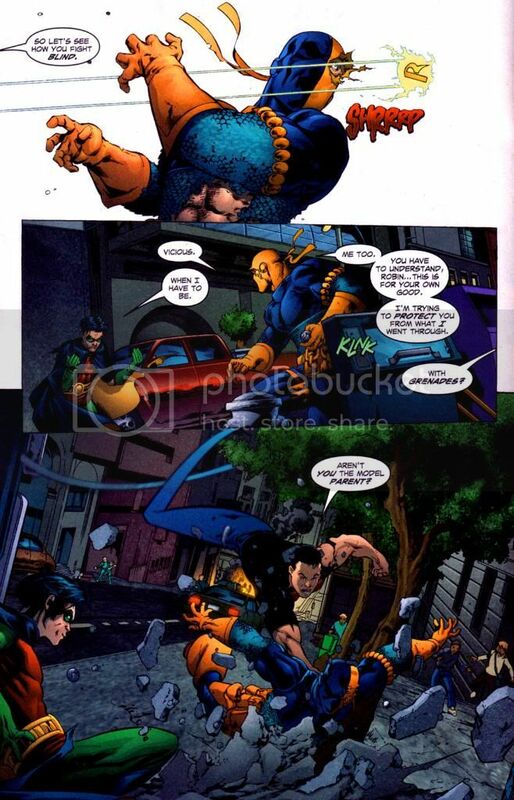 Another fight with an elite street-leveler while he's attempting to do a job.Evades Grayson's attack from behind, then puts him down with a kick. Floors him again with a backfist, evades another attack, and then overpowers and slams him against a wall when he tries to grapple with him. Then he jumps off a freakin building, landing on his feet, damaging the concrete below, unhurt. Grayson gets in his way again, and this time he punches him out. 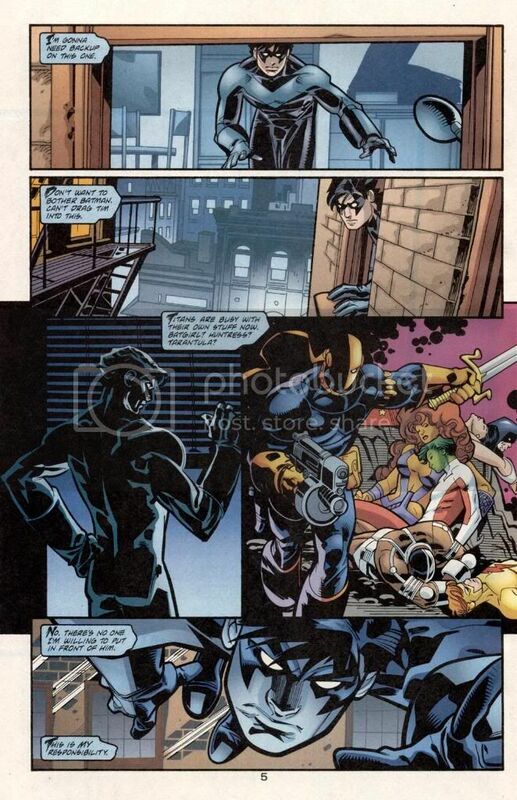 Grayson knows he can't take Slade in close combat, and says that fighting slade is all about "distance and evasion"
Scatters them with explosives, owns robin and almost kills him, but Kid Flash grabs his bullet, diaasembles his gun, and blitzes him. Slade again is able to get the best of the blitzing flash though. 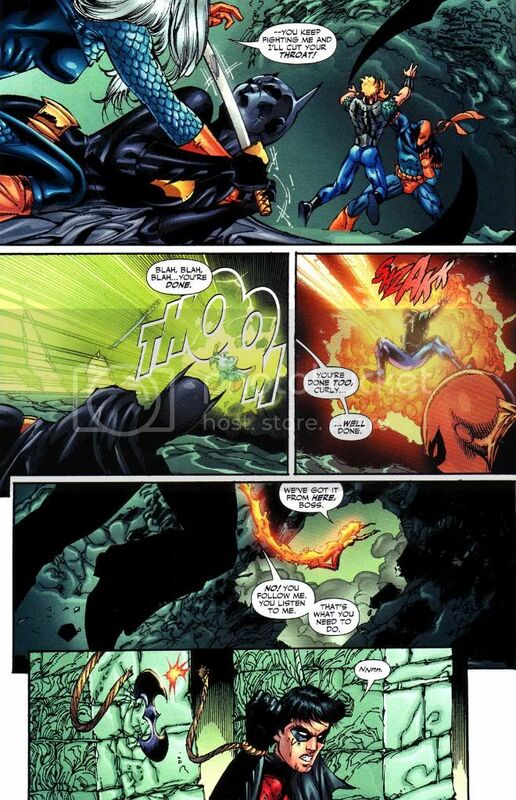 Slade is beaten, but takes alot of punishment. Floors Elongated Man, Flash, Zattana, Hawkman, sabotages Green Arrows Weaponry, floors Black Canary, Detects and neutralizes The Atom(who considers him the world's greatest tactician), breaks Kyle Rayner's hand, nuetralizing his ring somehow. During the struggle GA jumps up and stabs his good eye out, then the entire roster is struggling to subdue him with force. He escapes with the help of Doctor Light. Complete. Effortless. Ownage. 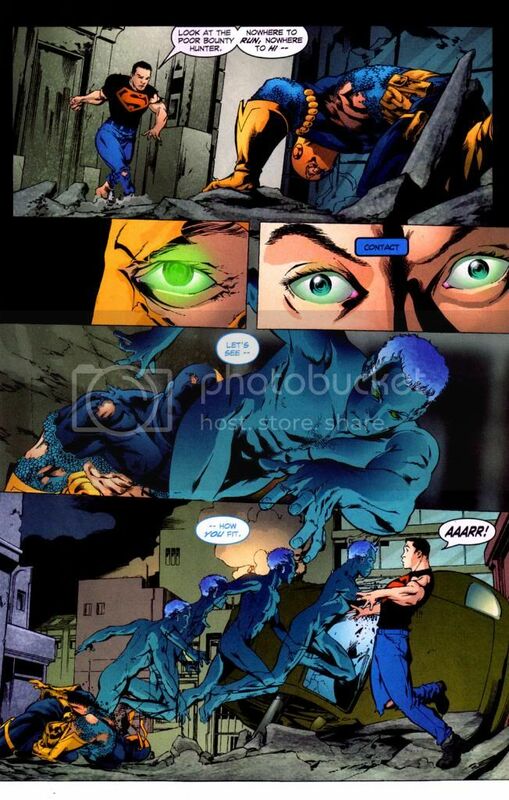 Slade evades all his blows, except for when he purposely takes his blows(which don't seem to affect him at all). 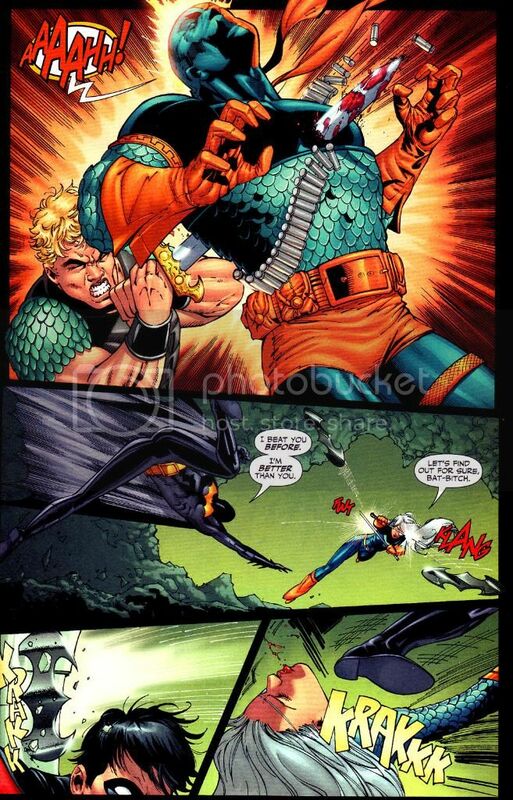 He floors him a total of three times, and let's him live because of his scars, which I guess Slade sees as a warrior's pain. 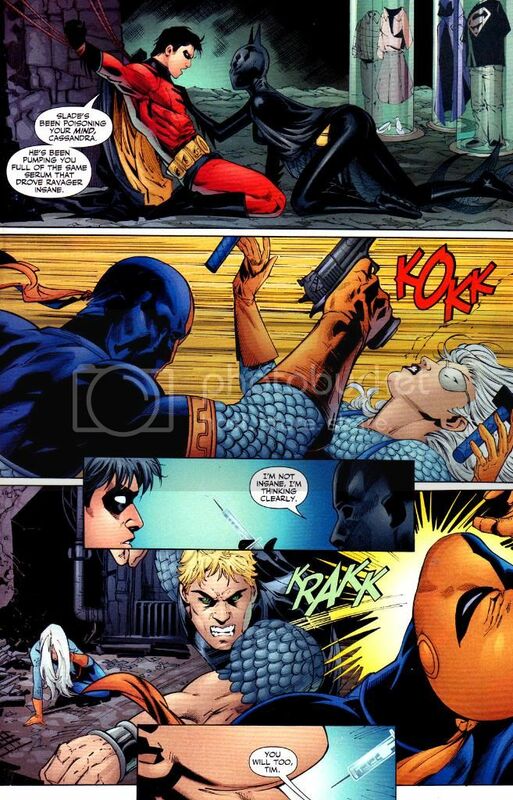 Deathstroke Vs. Cassandra Cain, Round 2. Slade's toying with her and she knows it. She claims he's hard to read, probably because of how fast he thinks.It's a stalemate I guess. Batgirl acknowledges Slade as faster, among other things. Just included this because some seem to think that some peak human street levelers can match or even exceed his speed. Cassie, being a bullet timer, is the among the best of the best in the peak human speed category, but even she isn't foolish enough to think she is faster than a true metahuman. 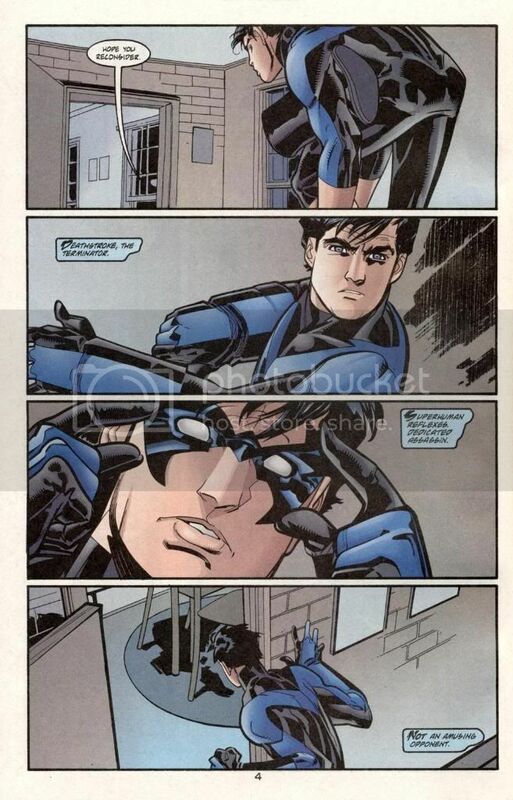 Deathstroke Vs. Nightwing, Round 6. Just a slight scrimmage. Slade easily comes out on top, as he most often does. Shoots Cheshire. He says it's because they don't accept traitors in the society, but I'm better sure it's payback for her having him unwittingly involved in the destruction of an entire country. Deathstroke Vs. Deadshot, Round 2. Slade pretty much comes out on top(which, in a quickdraw with Lawton, is saying a lot), but technically a stalemate I guess. 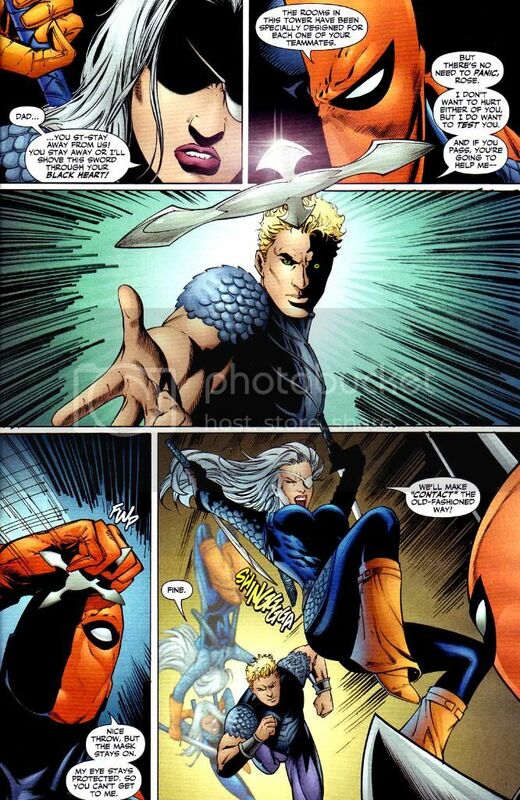 Deathstroke Vs. Black Canary, Huntress, Creote, and Lady Blackhawk. BC and Huntress are obviously no match for him, and Slade just wants to finish a job. He's lenient, but they won't budge, so he snaps BC's arm. Through a series of others coming to the rescue though, these Birds of Prey eventually get the win. 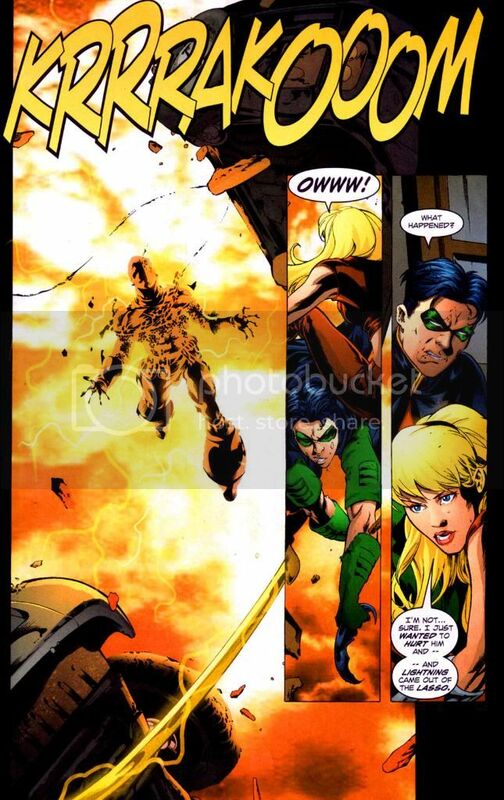 Even so, Slade still shrugs off the direct blast of a bomb that encased him in the wall, and an arrow. He also cuts a few of GA's arrows in half, including splitting one down the middle, and manages to do well in a sword fight with him while glued to the floor. Seems pretty out of character for Slade, at least IMO. Yeah...Slade's character has been misused by DC for a while now. I never really like how he was portrayed outside of Wolfman's run of Teen Titans or his ongoing. He's still a badass, though, but I preferred Slade as a anti-hero with heavy shades of gray than an a-typical villain. Jericho is probably more superhuman in physical aspects than Slade, and Ravager has precog and has improved to the point where she can contend well with Batgirl(Cassie), but there still just his children. Slade is just plain working them over. He says " I can do this all day". Eventually several more Titans, including Cyborg, Flash, Wonder Girl, Miss Martain and Raven come to the rescue, but he still gets the best of them, easily dodging an enraged Batgirl and then scrambling them using Cyborg's sonic attack.